I'm getting together with some girlfriends this week and needed something I could make ahead of time and reheat later. I adore savory tarts and seeing as they stand up pretty well to reheating, decided one would be perfect for this event. I've seen potato pies with layer upon layer of thinly sliced potato and gooey, melty cheese and have always wanted to make one. This is my attempt at something similar in a tart. The caramelized onions are what really pull the flavors together. Place the flour, salt and dill in a food processor and pulse until well blended and dill is chopped and distributed throughout the flour. Cut the butter into small pads and add to the food processor. Pulse until small crumbs start to form. Pour mixture into a bowl and drizzle in the water starting with 2 T and adding more if needed to get the dough to come together. Form a disc with the dough, wrap in plastic wrap and refrigerate for 30 minutes. Peel the onions, cut in half lengthwise and slice thinly. Heat 2 T olive oil in a small pan. Add the onions and cook until brown and caramelized, stirring occasionally. If the onions begin to stick to the bottom of the pan, add more olive oil 1 T at a time. Preheat oven to 375*. Place the fingerlings in a pot and cover with water. Bring to a boil and cook for 3 minutes until just starting to get tender. Drain and let cool slightly before slicing lengthwise into very thin slices. Roll the dough out on a floured surface to fit a 9" tart pan. Transfer to the tart pan, line with foil and fill with pie weights. Bake for 30 minutes until golden on the edges and let cool. Spread the mustard over the bottom of the tart crust. Sprinkle half the caramelized onions over the mustard, followed by 1/4 cup of the shredded Italian cheese. Layer fingerling slices in a concentric pattern and repeat (onions, cheese then potatoes). Beat eggs, cream and nutmeg together in a bowl and pour over the tart. Bake for 20 minutes, remove from the oven and sprinkle the parmesan cheese over the top of the tart. Return to the oven and bake for an additional 20 minutes. Let cool slightly before serving and enjoy! Amazing! Love the caramelized onions! 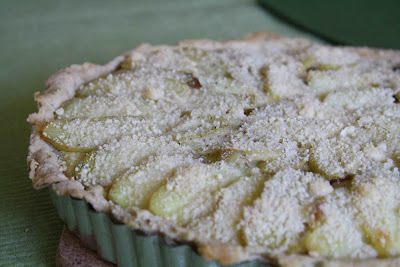 Your tart looks divine and it is almost always caramelized onions that makes everything taste better. I truly dig caramelized onions!!! What a gorgeous tart! The onions won me over! Hi there. Came from Picky Palate. Love your blog, especially the name. This potato tart looks incredible. Love potatoes but never had a tart with them. Now this is a tart I could easily become addicted to. This not only looks gorgeous, but the recipe sounds fantastic.